Words and images by Roberta Perrin. It was a natural progression for me to start working with herbs and crystals. I started reiki treatments around 4-5 years ago, and it lead on from there. When I first starting using crystals, I was astounded at how strong the connection was with them and how they made me feel. It opened my eyes to a whole new world, but at the same time, it felt like I was returning home to some old knowledge I had somehow forgotten about. I grew up, and still live in the country, so we always grew herbs in the garden and I had my own pots as a child that I enjoyed growing – parsley, rosemary, mint and chives were my first ones, I think. When I started making my crystal oils, it felt natural to include herbs and flower petals with them. Herbs, and all plants and trees in general, have magickal associations and energies of their own, so combined with crystals, another wonderful gift from the earth, they can deliver quite a wonderful connection to Source and a deep feeling of contentment. During the rise of pharmaceutical companies in the 20th century and the marketing that went alongside that – drugs are good, drugs and chemicals are the only cure for your ills - the naturopathic community was branded as nonsense and that idea seems to have pervaded culture for some time. Until the last couple of decades, that is, where the natural path has become something that more and more people are interested in exploring and that’s a very positive shift in collective thinking. Herbs and crystals, and the whole metaphysical, holistic world has become so popular in the last few years, and I believe it’s reflective of society turning their backs on the institutions that pretend to have our best interests at heart, but clearly don’t and are just profit hunters. People are looking for a deeper connection and using your own herbs and crystals is a way to connect with yourself and with the world around us. There are some of us who, having found ourselves on this path, feel as though this knowledge was always inside us and it’s a return to our roots. I’m definitely not alone in this. It feels very natural to me to work with nature’s ingredients and of course, since I personally only use 100% natural ingredients in my products, there is a confidence in knowing there are no harmful substances involved in the process. 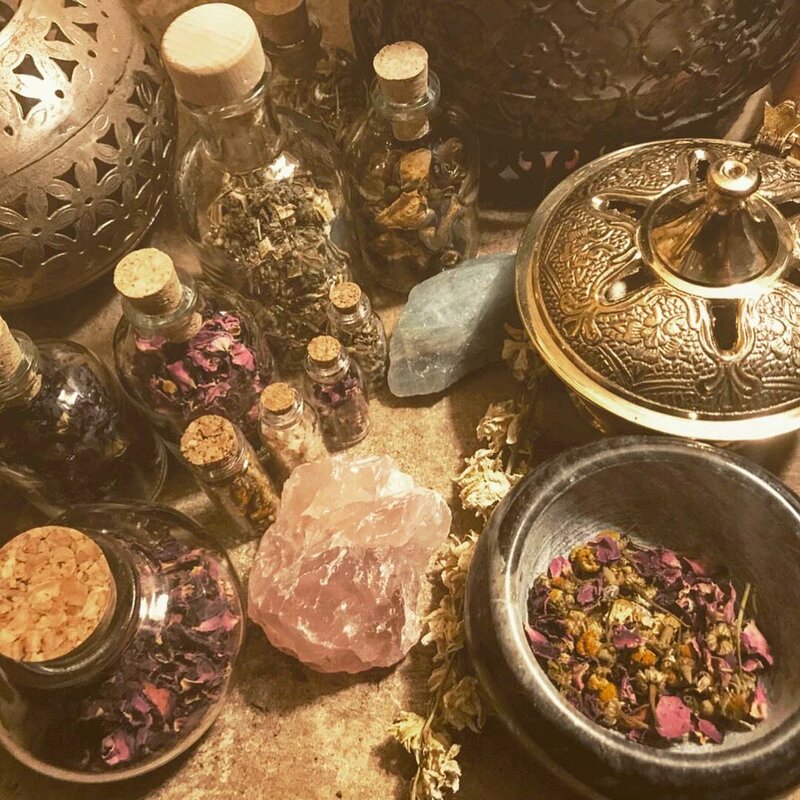 Crystals, herbs, natural oils etc.. are all gifts from Mother Earth, Gaia, whatever name you use, and working with them brings a real sense of peace and a connection with the wise women of the past, who lived in the age before chemicals and drug corporations. There is a feeling of returning to what is right. I perform an entire ritual process when creating my oils – there are many steps which are too elaborate to write down here, but it involves cleansing the crystals, programming them with intention for each individual client, and later blessing the finished product. Crystals emit a frequency of energy, and if harnessed in the right way, can be used in oils, elixirs and even water to deliver the energy straight to you and the body will know what to do with it. Self-care can be as simple as setting aside five minutes to just be with yourself without external distraction and unwind the stresses of the day. My oils are designed to be portable, so wherever you are, you can take a little time for yourself and apply the oils to your wrists, neck etc.., inhaling deeply and releasing whatever negative energies or stresses that may be lingering. I use them before meditation, as I find they calm me and help me get into the right frame of mind. I offer many different types of oils for different purposes, for example self-love, grounding, channelling, and relaxation. I also offer an option for custom-blends so if you have a specific crystal or purpose in mind, I will be very happy to discuss and make it for you.